Armi & Balistica - mensile n. 74 Marzo 2018 "Novità Shot Show 2018"
COLTELLI N. 78 OTTOBRE - NOVEMBRE 2016 BIMESTRALE. ARMI E TIRO. N. 10. MENSILE OTTOBRE 2016. ARMI MAGAZINE. N. 10 OTTOBRE 2016. LA VETRINA DELLE ARMI USATE E ANTICHE. N. 136. SETTEMBRE 2016. ARMI MAGAZINE. N. 9. SETTEMBRE 2016. 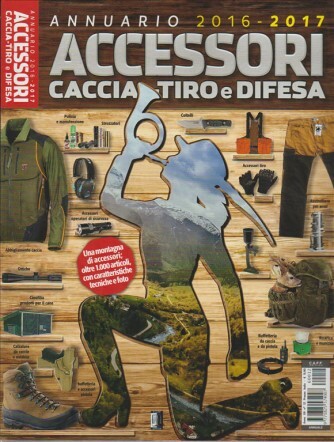 ANNUARIO 2015 - 2016 ACCESSORI CACCIA - TIRO - DIFESA.